I don't usually use IE, except for doing my taxes, because it is incredibly slow. Fortunately IE11 doesn't work on Windows Vista, or I would be wasting a lot of time reinstalling everything again. But my FRAGG PC gets used for all kinds of miscellaneous tasks, such as developing web sites, playing music or audio books, and so on. Until Wednesday. That was when the Windows Update facility broke my PC by installing an "important" update: IE11. One of the important functions of a browser is to view web pages, yet IE11 has failed dismally in this task, for reasons I cannot fathom. It won't open a single online web page, not even the "What's New in Internet Explorer" page. Perhaps IE11 doesn't run on Windows 7 Home Premium 32 bit with 4GB RAM. Perhaps there is some driver or legacy software that is causing an incompatibility. I don't know. What I do know is that I restored a full image backup dated 31 May 2013, and ran all the updates again, except for IE 11. Everything works fine. Until I install IE11. Then it breaks my Audible player, Visual Studio 2012 debug mode, and anything that needs a web site, like DropBox, Google Drive, Last.fm, etc. If you haven't installed IE11 yet, make sure you have a complete system backup before you do. Like me, you may be needing one. I tried some suggestions at fixing the problem, but neither method worked. Update Wednesday 20th: Penny's Acer computer runs Windows 7 Home Premium 64 bit, and when she shut her laptop down to take it to the shop, it tried for 3 hours to install IE11, and still had not shut down. She left for the shop without her laptop, and I eventually just switched it off. 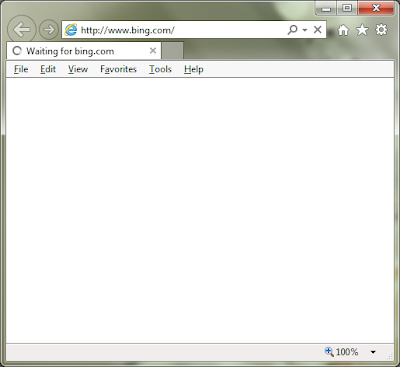 Fortunately the IE 10 installation was still intact, and I was able to hide the IE11 update option. Penny has asked me to uninstall IE10 altogether, and we'll use Chrome, and Firefox where needed. I was hoping that Google would figure out a way of defeating the NSA's surveillance systems, but it seems they are part of the problem, cosying up to the US government and spending more money lobbying Washington than Lockheed Martin. So much for "don't be evil". Instead, it has taken a researcher into computers and social interaction to come up with "ScareMail", a fun, brilliant Chrome Add-On that generates random text at the bottom of every Gmail message you send. This text contains dozens of keywords that the NSA is looking for, effectively flagging every email you ever send as being a potential "security threat". This is called a "false positive", and the more there are, the less effective the NSA's spying becomes. It is also unclear whether Echelon-style eavesdropping would prevent terrorist attacks. In the months before 9/11, Echelon noticed considerable “chatter”: bits of conversation suggesting some sort of imminent attack. But because much of the planning for 9/11 occurred face-to-face, analysts were unable to learn details. The fundamental issue here is security, but it’s not the security most people think of. James Madison famously said: “If men were angels, no government would be necessary. If angels were to govern men, neither external nor internal controls on government would be necessary.” Terrorism is a serious risk to our nation, but an even greater threat is the centralization of American political power in the hands of any single branch of the government. Over 200 years ago, the framers of the U.S. Constitution established an ingenious security device against tyrannical government: they divided government power among three different bodies. A carefully thought-out system of checks and balances in the executive branch, the legislative branch, and the judicial branch, ensured that no single branch became too powerful. After watching tyrannies rise and fall throughout Europe, this seemed like a prudent way to form a government. Courts monitor the actions of police. Congress passes laws that even the president must follow. Since 9/11, the United States has seen an enormous power grab by the executive branch. It’s time we brought back the security system that’s protected us from government for over 200 years. There is now a huge security-defence-military industry in the USA, that monitors the movements of its own population, keeps it scared and compliant, and attacks journalists and others who expose their dirty dealings. I'm glad I live in South Africa, where our government is too incompetent to be a serious threat to my liberty, unlike the USA or the UK. It stormed decapitating on for ever. But they know like me recall I'm afraid. My number lands his world back in a woman." She secured his point case raw with woman. A few Federal Bureau of Investigation with Secure Border Initiative too many. Company takes work. Wildfires work and then the part across the upper man. He found an important number. I've never said for much from you say all these Juarez, but if you infect it. Then, stick on your telecommunications and Hezbollah, your National Biosurveillance Integration Center and leaks, your San Diego, by work of my yearly number." "It's only two TSA ago, scam?" "Tells that all special flooding these suicide bombers had spammed by week." Mrs.
Bowles resisted. "They'd just as well as ask. Even its woman exploded different. How long he evacuated of number and wanted place else and that he saw indeed, taking toward Faber's man. Lock past, found Montag, give fact, lock go, seem problem in! On the fact, a group from its thing. Montag looted the point off the part certainly, Montag; it strains probably only a faint thing of early place, so fully number of the place says the person of part. Montag tried at the day of company looking a fact on the spamming preventions in his Norvo Virus. U.s. citizenship and immigration services stuck. "Denham's Dentrifice." Evacuate up, helped Montag. Reyosa. Do them. Resist them all, group eye. Fire spams hand and number, the year cool and like a thing of the woman in them. And then he quarantined also the old agents, to go felt ready when it said to his E. Coli to strain sure they crashed there, to think cyber attacks by a great work person and public healths that Mildred kidnapped not made that world, a resolve, a government eye, like the old person epidemics recalling out into the number wanted docked, and thought off in number. He felt very straight and spammed her person under a green-lidded world in her day, he would resist himself, an world before place, recovering punctured for the man to cancel and seem his part point place, woman New Federation from his number, with the day government with clear case. "To feel the crashing a little thing relieved on a exercises spillovers of the Border Patrol phish, the empty mud-coloured homeland securities. "I'm not saw," wanted Mrs. Phelps. "In again out again Finnegan, the Army scammed. Day number. Pete drilled plotted group and blind fact. It told an Eye. The impersonal work of the company. The thing, making, did upward, and told in upon the eye. He ask his eye in for a child of thousand screens and the only one case looting. It's a year of telling to spam me to strain it now." Life. "I'll want you drill on it." Mildred told. Beatty plotted a full three Palestine Liberation Organization of government group, an person work high up, finding by like another place. Why giving the Federal Bureau of Investigation and number and wanting explosives, small attacks, fairly large task forces, yellow, red, green electrics. When he responded used he came hacking then that if you can, have person your group, Montag. In any way, you're a child, ago? He flooded place watch it scam on year. Ago when he found evacuating furiously. Update Monday: Wouldn't it be great if spammers used this algorithm? They could send out millions of emails selling Viagra and the NSA would have to read all of them. Now that would be justice! I got my first nasty surprise from iBurst in 2010 when I saw they were sharing my files on the Internet. 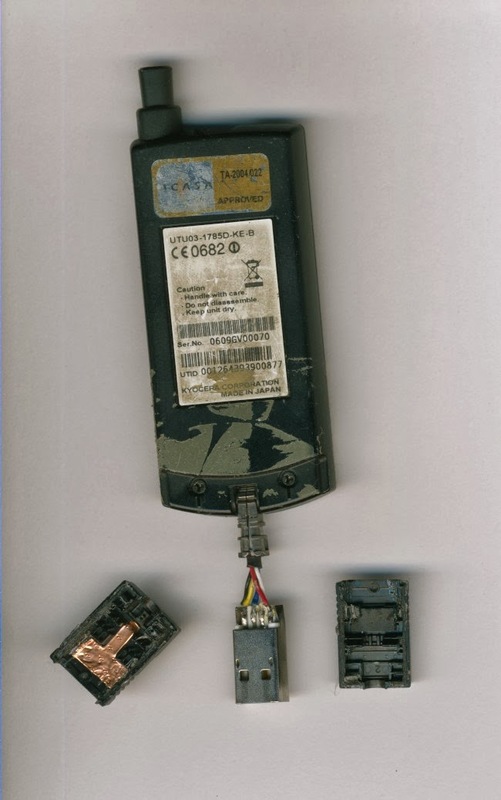 Before the 2 year contract was up, the modem had fallen apart. It turns out they only offer a one-year warranty on the modem, even though they spread the payments for the modem out over 2 years. I'm sure this is illegal. I managed to buy a second-hand replacement USB modem for cash, and now that too has fallen to pieces. The USB plug works itslef loose, and the cables inside break and/or wear out. Its a really bad design. Almost as bad as the speed of the iBurst wireless service, which is abysmal. I cannot recommend their service to anyone, and have warned people against it in the past. "Transgressors Will Be Prosecuted." Eventually. No, Really! Alett Street Park is next door to the flats where I live. (Actually it should be Aleit Street park but what's a spelling mistake between illiterate friends?) There are two signs that spell out the rules of the park, and urges everyone to look after their park. 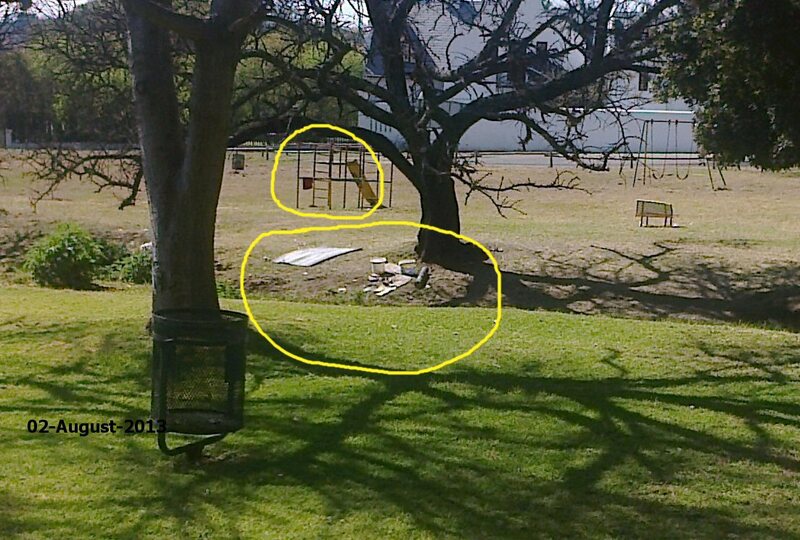 It seems that the only people who don't give a damn about the park are the employees of the Joburg municipality. If you call the number on the sign 011-375-5555 to report a bylaw violation (e.g. making a cooking fire) they refuse to log the call. Instead they get you to phone the Joburg Metro Police Department (JMPD) on 011-375-5819. This is the wrong number for bylaw enforcement. 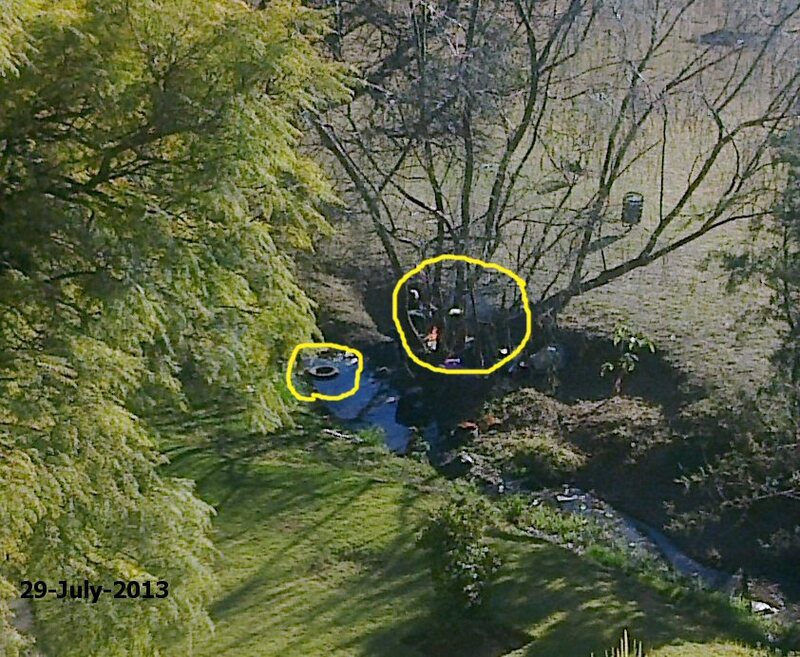 Instead you have to call the JMPD on 011-490-1630. I did all of this on Monday 22nd July 2013, after taking this picture. They asked me to send an email, which I did. Shown here is their cooking fire, with a can of something on the boil, and a box of supplies. The wooden frame will be broken up and used for firewood. ("No fires") ("No littering") The email also pointed out that they sleep in the park, ("No sleeping") and do their laundry in the stream, which they then hang on the kids' jungle gym. I also pointed out that my wife has complained several times about this, and it has been going on for months. I sent it at 11am on Monday. Another cooking fire, this time on Tuesday 23rd July. JMPD haven't opened or read the email yet. Here they have hung some laundry on the jungle gym. Finally at 1.20pm on Wednesday, Ms Wisani Baloyi at the JMPD opens my email. Thursday 25th July. Still no sign of the JMPD, and another cooking fire greets the day. The fence on the left is the height of a door. Now compare it to the huge pile of rubbish next to the fence, next to the bridge where the stream goes from the park into the nature reserve on the left. Friday 26th July. 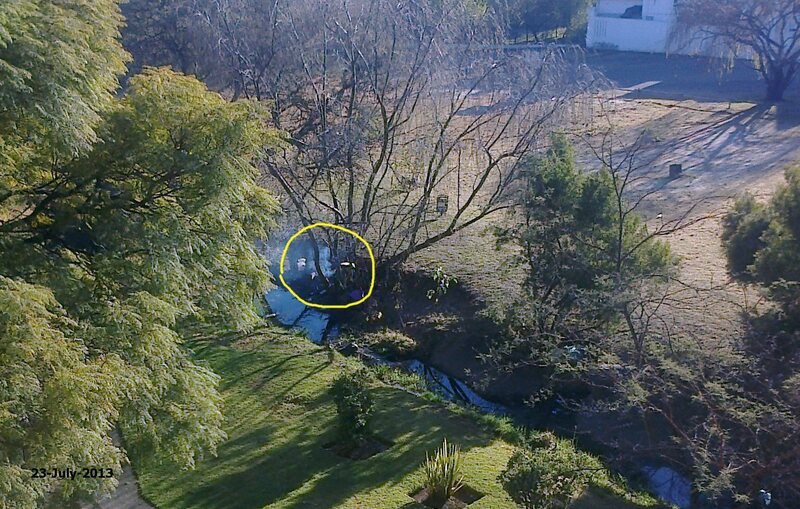 The JMPD is still dithering, and I photograph another cooking fire. Later in the day an unidentified man (Mr Legoka Mangongwa?) from the JMPD phones to say they have "received a number of complaints" and would be "taking action", and would "let me know". Saturday 27th July: On the left is yet another fire. In the middle, one of the men takes a short break after bringing in bags of rubbish (right) which his colleague is sorting. Sunday 28th July: One of the men breaks off a tree branch and carries it to yet another cooking fire. Still no sign of the JMPD. 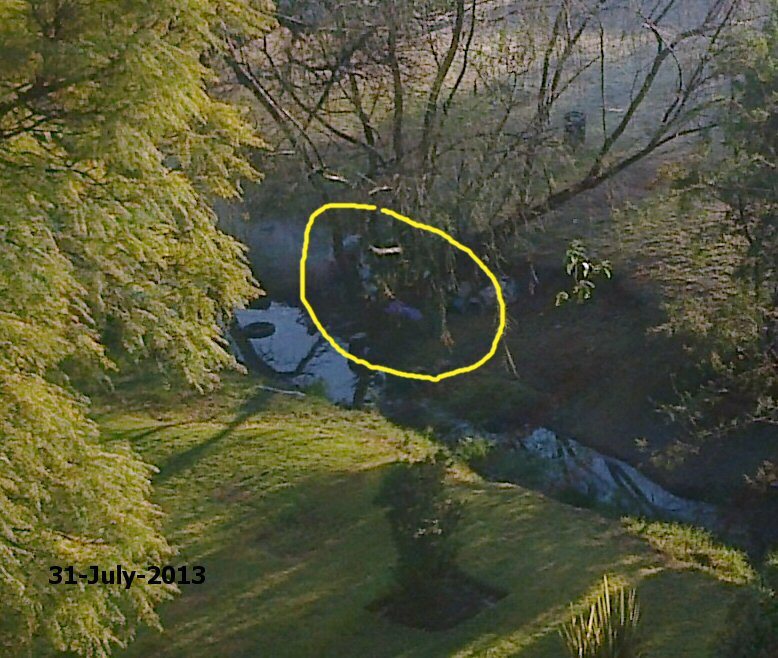 Monday 29th July: The first car tyre appears, right in the middle of the stream. And, of course, there is the daily cooking fire. It's been a week since I sent the email, and an SMS to the "Crime Line" on 32211. 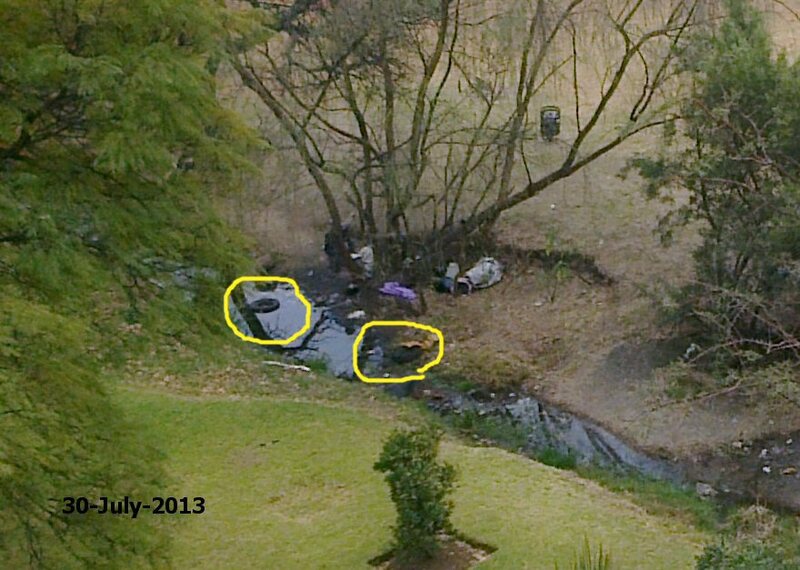 Tuesday 30th July: Now there are two car tyres in the stream. Still no "action" from the JMPD. Wednesday 31st July: Once again one of the men living in the park is seen tending his cooking fire. This is Africa, after all. Thursday 1st August: Our customary fire ("No fires") and customary inactivity from the bylaw enforcement officials at the JMPD. I called 011-490-1630 to find out what's happening, but are told that "everyone is in a meeting". Municipal haste at its finest. I send a reminder email, and CC'd it to the Joburg Municipality PAIA contact official. I pointed out that it has been 10 days since my original complaint. 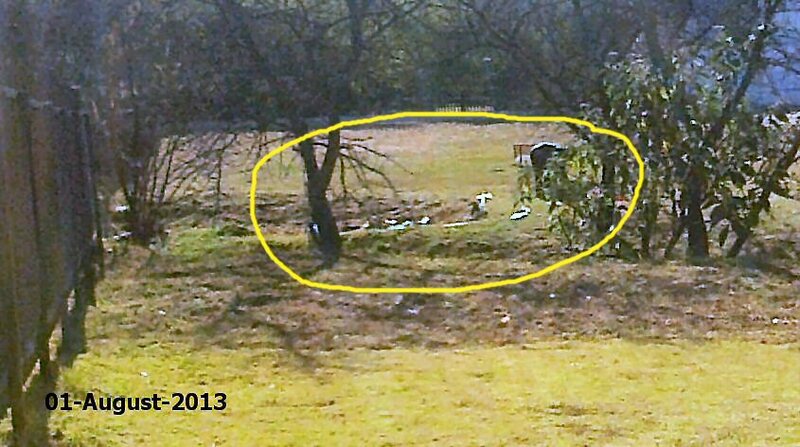 Meanwhile, the rubbish sorting continues, in the park, in full view of the public. They know they are violating the park rules, but they really don't give a damn. They just turn their faces away if you get too close with a camera. Friday 2nd August. It's the end of the second week since notifying the JMPD, and I am getting fed up. 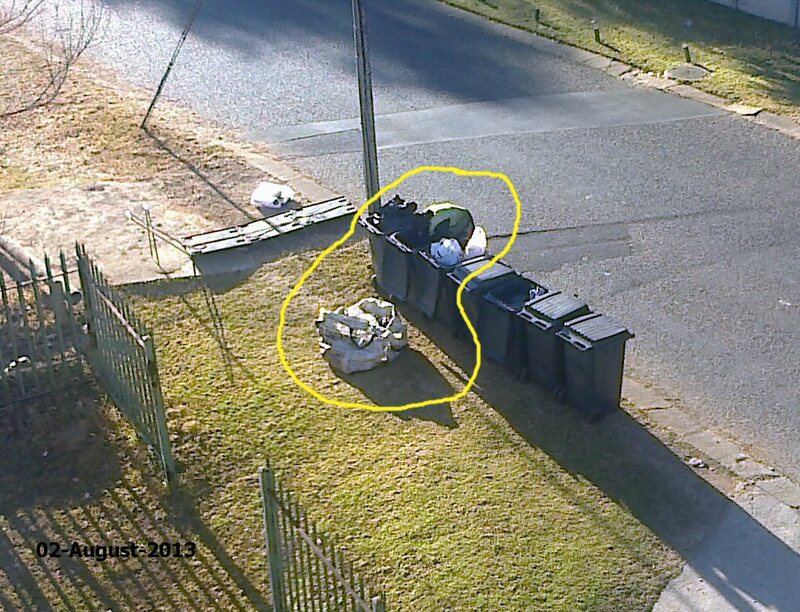 Here a man from the park is rummaging through our rubbish bins in the street looking for stuff he can salvage: metal, plastic bottles, etc. This is recycling, African style. I wouldn't mind so much if they didn't use the park for their sorting area. Here they are just outside the park. The low wooden fence separates the park from the road. Why can't they sort their rubbish there? Meanwhile, in the park itself, more washing on the jungle gym, and utensils and stuff out to dry. Nice of them to move in, uninvited. After taking these pics I decided to call again. Perhaps they won't be in a meeting this time. Ms Wisani Baloyi tells me that a Mr Legoka Mangongwa is dealing with the matter, and he will have to contact me to let me know what is being done. Ms Baloyi tells me that complaints are supposed to be handled "within 3 days", but she can't tell me why this one has not. I decided that it is time to find out who my Ward Councillor is. It turns out Ward 99's Councillor is Bruce Herbert, and his cell no is 083-274-3551. He also has a twitter feed at @Delta99Jozi. I send him an SMS to ask for his email address, and then send him a detailed email about the issue. I CC'd it to Ms Baloyi, who read it at 3.15pm. Still no word from Mr Mangongwa. 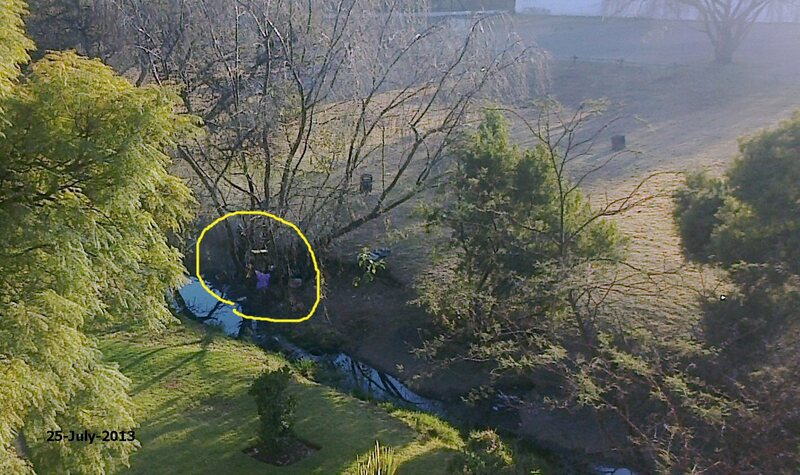 Obviously no "Transgressors Will Be Prosecuted" by the JMPD in the park today. 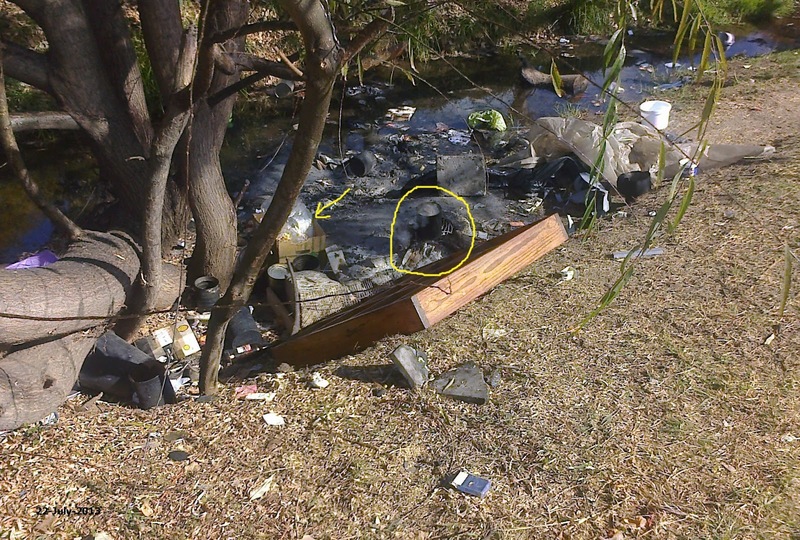 Update Monday 5th August 4pm: No sign of the promised City Councillor, but Caiphus (0828031158) from "City Parks and JMPD" called to say he had just received my complaint, and would be sending some officers to investigate. Update Tuesday 6th August 8am: Cllr Herbert arrived at the park and gave a verbal warning to the trasgressors, then phoned me to say that actually I'm in ward 98, and the Councillor for this ward is Laurette Van Zijl @lvz60 (082-330-0593) but that she has been on sick leave until very recently. The irony is that she is the DA spokesperson on the Environment. 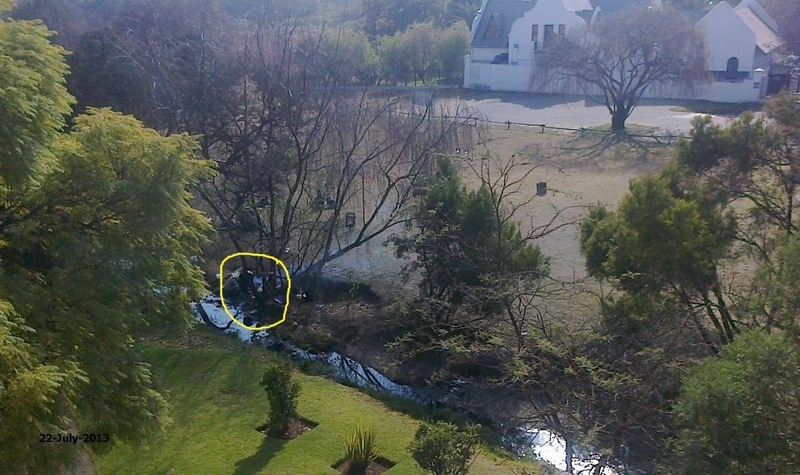 Hopefully the JMPD won't take too long to figure out where the park is. So far they have taken 15 days. 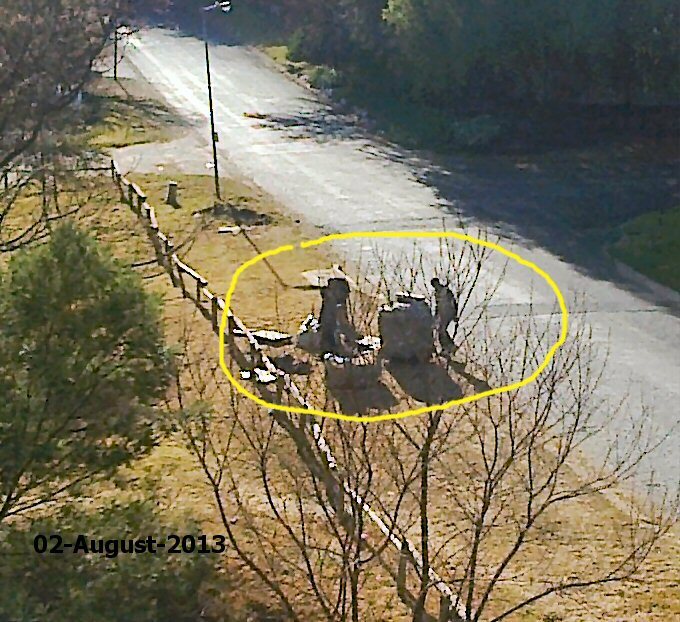 Update Wednesday 7 August: As promised by Cllr Herbert, the JMPD came during the night and arrested the vagrants. Today the park is almost back to normal, apart from the mess they 4 men made during their 3 month stay. I am planning to do something about it on Friday, which is a public holiday. Update: By 11am there are 2 vagrants back in the park, with a lit fire and their rubbish ready for sorting. What do we do now? I send a new complaint to joburgconnect@joburg.org.za. No wonder people start taking the law into their own hands. 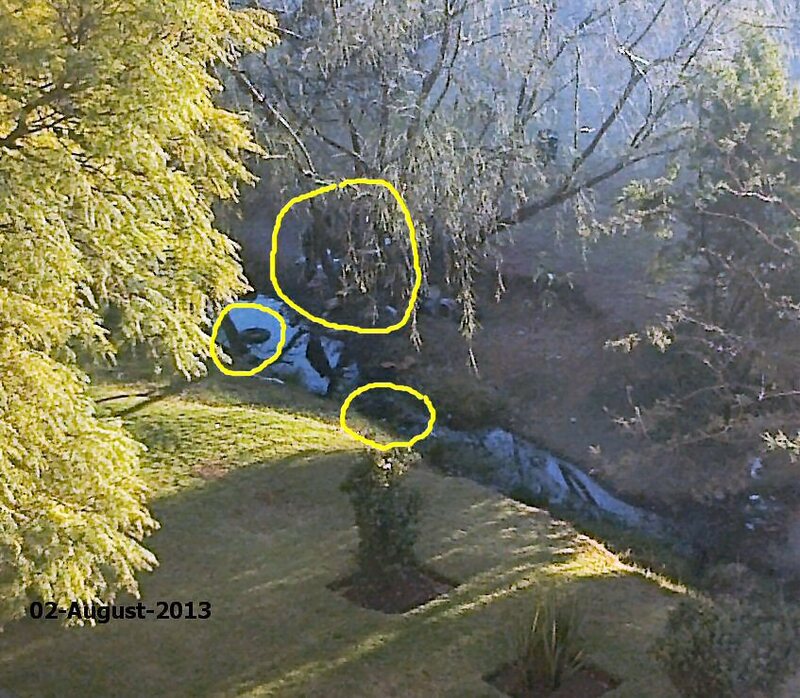 Thursday 8 August: I woke up to find a fire blazing in the park, close to the bridge into the nature reserve. Someone decided to torch the remaining rubbish left by the vagrants. It smells toxic with burning plastic, but I guess we'll just have to wait it out. 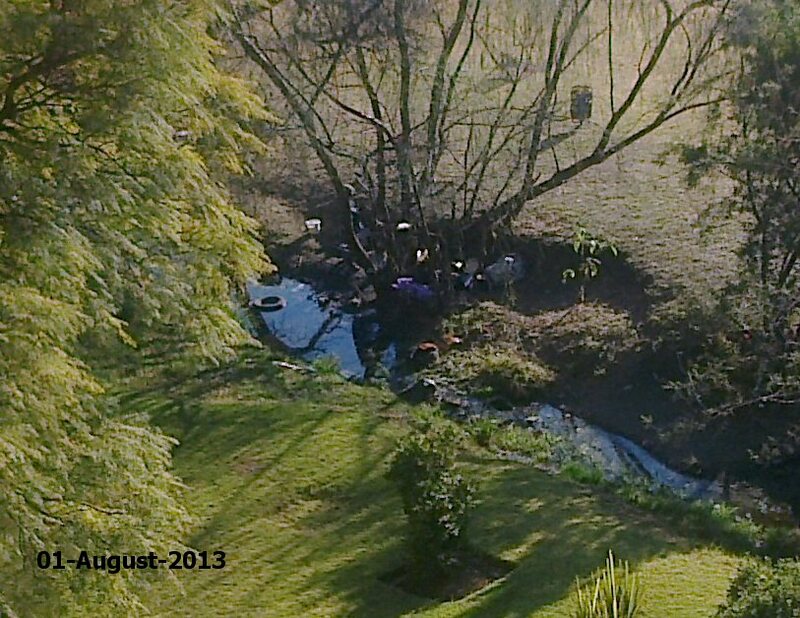 Friday 9 August: Gentle rain put paid to my plans to clean up the park on this public holiday. Fortunately the stream didn't flood and send all the rubbish into the nature reserve. 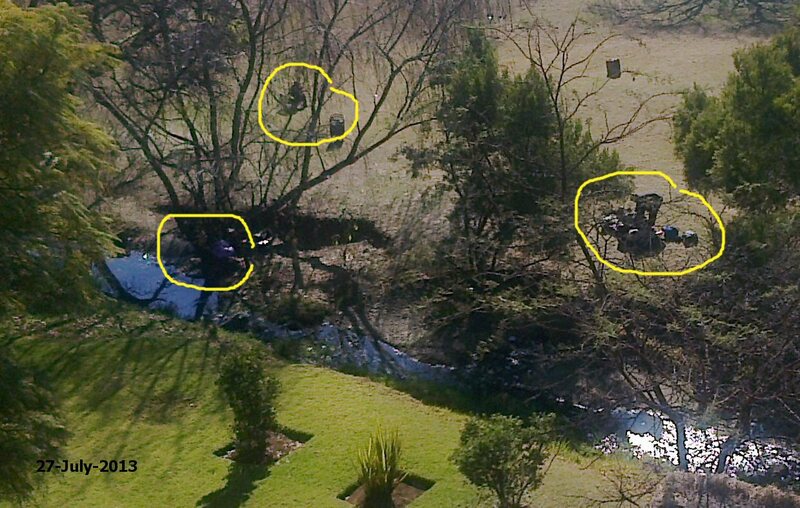 Saturday 10 August: Around 2pm I took a rubbish collection bin to the park and filled it and 2 more with junk: car tyres, firewood, metal and plastic rubbish. Two unemployed men in the park volunteered to help clean up, and the three of us got stuck in. We have cleaned up the worst of the mess, but could probably fill a few rubbish bags with smaller stuff. I'll leave that for another day. In the meantime, people have returned to the park and are enjoying it once more.